The hype/trend for Bubble Tea doesn’t seem to be slowing down at all. Just these two years, we have seen countless new bubble tea concepts popping up in Singapore. While most are palatable, the cut throat competition means it’s really tough to stand out from the crowd. And MUYOO+ certainly caught me off guard with their first-of-its-kind concept in Singapore. By pairing their signature Fruit Teas with their freshly baked Breads, who knew they would go so well together? The Easties are in for a treat because MUYOO+ will be opening their second outlet at Bedok Mall this coming Saturday, 1st September 2018. 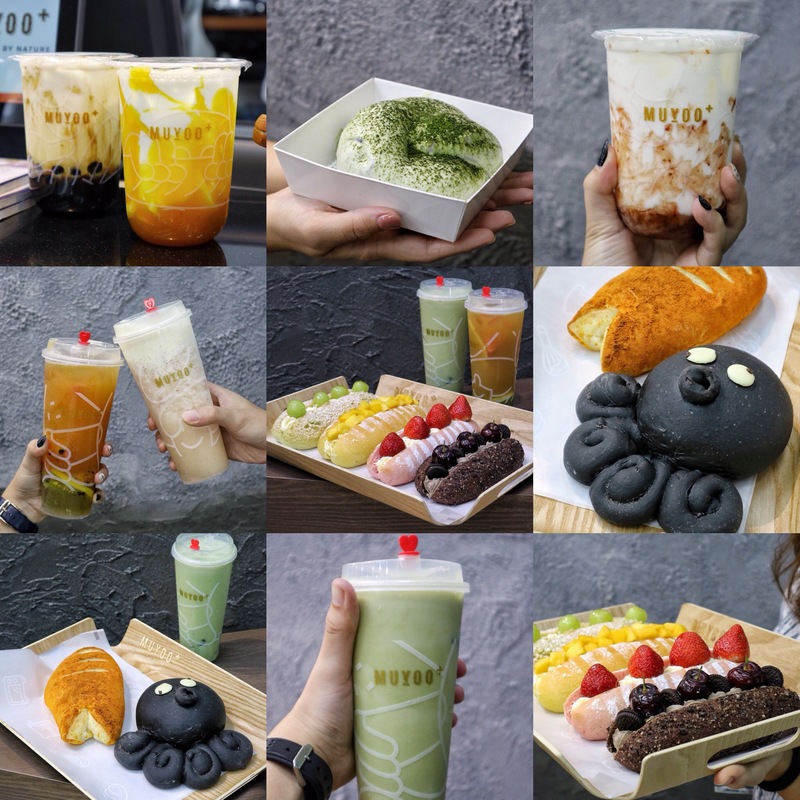 Personally, I’m in love with their ‘Dirty’ Bubble Tea category, especially their Dirty Matcha (not bias but it’s really good – thus a MUST-TRY)! On the other hand, their bread selection is no joke either, particularly their savoury items – Hot Crabby (very well-received by many of us) & Wasabi Octaki. If you prefer something sweeter, you can go for their ‘Rainbow Wand’ category which was too pretty to be eaten. So, mark your calendarssss and check out this new Bubble Tea/Bread eatery at Bedok Mall on Saturday! P/s: For the office crowd, you can now grab a quick lunch or tea break at MUYOO+. Well, guilty pleasure! Okay! We were all surprised at how huge the breads were, and they were really affordable as well (plus cute too). Personally, I preferred their savoury selections over their sweets. Bubble teas, on the other hand, were really good (at least for the ones that we’ve tried). They were all not overly sweet! From the front to the back, 1) Oreo Cherry Fairy Wand – $4.90, 2) Strawberry Rainbow Wand – $4.90, 3) Mango Rainbow Wand – $4.60 and 4) Grape Rainbow Wand – $3.90. Too pretty to be eaten man! It’s hard to pick one, so buy all! Haha! It’s always good to pair your breads with a drink and in this case, a good bubble tea and I mean Matcha (not bias hor). And now comes their cute savoury selection and our favourites – Hot Crabby ($5.90) & Ori Octaki ($5.90). So adorable right? This is not gimmicky by the way because the bread was really soft and fluffy. I also liked the flavoursome filling inside – combination of Tako (octopus), Italian Cheddar Cheese, Wasabi and White Chocolate Chips. Perfect combo! We also loved the Hot Crabby which was stuffed with fresh crab meat, Italian Cheddar cheese, MUYOO+’s secret sauce and finished off with curry powder. This was so good/addictive we dapao 3 home! Warning: Super filling okay! Anytime anywhere just for good Matcha and I’m super in love with MUYOO+’s rendition of Dirty Matcha ($5.90). They were generous with the Matcha powder, and the white chocolate paired really well with it. You can also find mochi inside the bun. Highly recommended! There’s also different flavours for you to choose from! Other than their breads, they also have a huge selection of bubble teas for you to choose from. Seriously, which one to order? Probably if you are residing in the East, you can order a different one each day. Sweetness overload! Personally I loved their Matcha selection – not too sweet and super shiok. Definitely coming back for this again. Matcha-lovers won’t be disappointed! They also have a ‘Dirty’ series which has been said to be very popular among Singaporeans. Try it to know why ? If not, you can go for their signature Fruit Tea series – very refreshing especially with the insanely hot weather in Singapore these days. 10th – 16th September: Buy 2 drinks and get 1 bread free. Spend a minimum of $15 and receive special MUYOO+ branded merchandises. 17th – 23rd September: Enjoy the 2nd item at 50% off, applicable for all drinks and breads. Spend a minimum of $15 and receive special MUYOO+ branded merchandises. 24th – 30th September: Enjoy 1 bread and 1 drink at 20% off. Spend a minimum of $15 and receive special MUYOO+ branded merchandises. Next Post(NEW) CMYK EVENT: Singapore is NOT BORING this September with 500 Local & International Booths! Shop, Eat, Play & Repeat!